Breakfast is served in our bright and airy dining room. Our aim is for your stay at Robyn’s to be perfect, so if you have any special requests or dietary requirements please let us know. 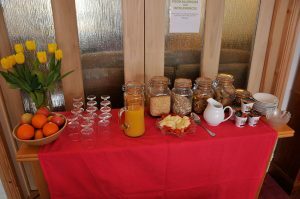 We offer a wide choice of cereals, fresh fruit, orange juice and yogurts available from the breakfast bar. Freshly made porridge is also available on request. 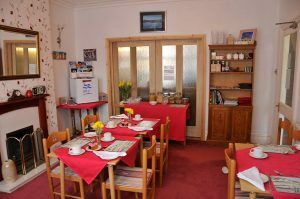 Breakfast is served at 8.30 or 9.30am (earlier breakfasts are available on request). If you don’t feel like going out in the evening you are welcome to eat take away food in the dining room. Egg, bacon, sausage, black pudding, beans, mushrooms, tomatoes and hash brown.